One thing that I absolutely dread is saying goodbye. Farewells I abhor, whether I be the one leaving or someone else. 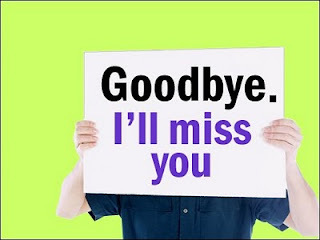 It’s the closest life change to death, with the only difference that a goodbye is not as final. Two days ago one of my best friends moved out of state. I find myself with mixed emotions; sadness, fear but also overwhelming joy all at once. Jen has stepped out in faith and valiantly left all her comforts to go where God is calling her. I am not angry with God's will. Rather I find comfort knowing that this is exactly His perfect will for her. It is a bittersweet season, where Jenni isn’t the only one learning, growing and being stretched, I too will be experiencing the same with her absence. Last Friday the youth Pastor called her and the youth leaders up, where we prayed over her. And so the sobbing continued as I realized that hours from then she would be embarking on a journey alone, not together. We have been inseperable for a very long time, serving God alongside each other, experiencing similar life challenges and changes together, and have been eachother’s accountability for so long. A gripping fear came upon me as I cried out to God in silence. Fear of having to say goodbye to my accountability partner creeped in to my once peaceful heart. He gave me this word that night, Psalm 138:3: In the day when I cried out, You answered me, and made me bold with strength in my soul. God is an ever present help in time of need, faithful to see the need of our hearts and meet us there. He never fails and is always on time. He calmed that fear and replaced it with His peace and filled me with His strength. Yesterday morning a received a text with this quote by Mike Macintosh, “God will bring breaking into our lives for the purpose of blessings.” Well… I am broken, so let the blessings POUR. A few minutes ago I read this verse, Psalm 46:5: God is in the midst of her, she shall not be moved; God shall help her, just at the break of dawn. He is so good. I believe this verse not only for myself but for Jenni as well. It’s a really weird time for me. It’s like I’ve lost a part of me. And though many have said to me that she is a phone call, email, text message away it is not the same. I will miss the random calls, “Hey, let’s go get sundaes at McDonalds.” Because they were more than just sundaes, they were a “Hey, I need a friend right now that I can cry with.” I will miss the random, “Let’s go to the movies.” Because it was more than a movie, it was an “I am so glad that you are single too and we don’t have to be alone.” And though I look back and know that I will miss many, many things about our friendship, I thank God that I was able to live them with a great friend. So yea, I am done venting. Keep Jenni in prayer and the kid’s ministry that the Lord will begin through her. I am confident that the Lord’s timing has been nothing but divine and perfect and many children and families will be blessed through her service and example. I thank God for her obedience. Be comforted, friend. God is faithful and honors what he blesses. I met one of my very best friends in my freshman year of college and, 30+ years later, we remain exceptionally close even though we haven't seen each other in the flesh for nearly ten years now. We shared an off-campus apartment in our senior year of college and during the interim years until grad school. At one point, after we both married and began our families, we even became next door neighbors (literally) for a number of years! She may live in the UK now, but there is Skype, Facebook, Messenger - all kinds of communication and virtual technologies available now, most with unlimited night time and weekend minutes :) that keep our friendship alive and well. You're right, it may not be the same, and it will take some extra effort to nurture, but your friendship can survive and even thrive until your "next time." True friendship, especially one grounded in God, grows - not diminishes - over time and transcends the seasons of life. So, may God bless Jenni as she leaves to pursue God's will. And may He be to you that Comforter Friend you especially need at this time. Thank you very much. May God bless you.